All About Pies has evolved from a fun family hobby to an established pie making business. Using a tried and true crust recipe, handmade pies are created in our kitchen to be enjoyed in yours. Our fresh-frozen fruit pies may be purchased, allowing you to bake and enjoy the aroma and taste of a fresh baked pie in your own kitchen. Simply call either Elaine (641)891-9068 or Amy (641)521-1146 to place your order, then make arrangements at one of our locations to take home a fresh frozen pie to bake! Jersey Freeze in Monroe (by the slice or in an alamode freezer). We hope that you will stop by soon to see what each of these shops offer (and of course, take home a pie to bake)! We appreciate your business! The pie shop will be open on "Bike Nights" in Monroe on the last Friday evening of each month from May thru August. 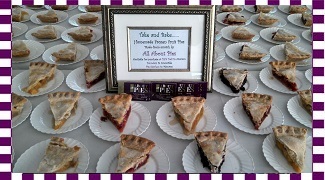 In August, we always enjoy working with the Monroe Kiwanis at Old Settlers - where you can buy our pies "by-the-slice". As always, we look forward to having our Knoxville Nationals fans stop by our stand in Monroe for a visit and to pick up a pie or two to enjoy while they are here "racing". We appreciate being one of their traditional stops when they are in our area. A big thanks to all of them! Stop by any of our locations and pick up a pie for any reason - snack at a tailgate party, a unique thank-you or birthday gift, baby shower , wedding, anniversary, dessert at a potluck supper, holiday event or just dessert for your family.